An invigorating deep tissue massage focusing on back area, using massage technique designed to soothe away tension and stress. It helps relieve headaches by stimulating the nerves on your scalp and the blood circulation within your head. You will feel relaxed and re-energised. 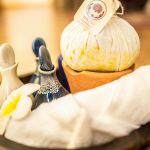 Additionally with the 60 minute-treatment, it begins with a Thai Herbal Hot Compress ball placed along the muscle line on your upper body to reopen the body’s energy pathways. 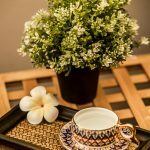 “Thai massage” or “Thai yoga massage” is a unique massage technique that combines acupressure, Indian Ayurvedic principles, a nd assisted yoga postures offering fully clothed (Thai Pyjamas) and without oil but with assisted Thai Balm. This massage uses passive stretching and gentle pressure along the body’s 10 major energy lines to increase flexibility, relieve muscle and joint tension and balance the body’s energy systems. This begins with 10 minutes using our Thai herbal steam sauna to release muscle tension and stress. This is then, followed by a massage using a combination of Thai massage and sport stretch massage with stronger pressure focusing on the deep layer and stretching of muscles. 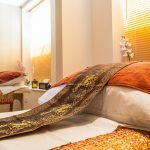 Thai Aromatherapy Oil Massage is a combination of East and West techniques, comprising of Thai-style deep massage combined with sophisticated western-style Swedish massage. It is a truly relaxing treatment using our unique blended oil with 100% pure essential oils and nutritious carrier oils. It helps increase the blood circulation and lymphatic flow and total relaxation from muscular tension. 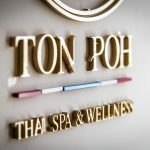 We offer 5 choices: TON POH massage oil, STRESS AWAY massage oil, DREAM massage oil, CALM massage oil & HAPPY massage oil. Why dont add a Thai herbal compress ball for extra relaxation! An alternative medicine involving the application of Thai balm and simple pressure through the fingers to the reflex points in and around the feet, which in turn will affect specific parts of the body. Help to balance by relieving stress and tension.